Heck, I remember seeing -173°C somewhere in real life. Again, something was bugged. So now is no longer raining here, clouds are getting away leaving a sunny day (Again, check my profile for my local hour before saying it cannot be sunny in the middle of the night ). I saw 70 degrees as a high in the middle of February....and the actual temperature was only as high as 30 degrees. It's a bug, I know, but those bugs are hilarious. -7° F tonight, 18 mph wind, about -30° F wind chill. Fingers crossed for this pattern to bring a return of heavy snows soon. -2 and falling. Was -4 in Warrensburg 3 hours ago. Wind chill in Troy is -25 and it's going to fall as the temperature gets colder. Skies are clear, so I expect at least -10.
clear & 34 now expecting a low of 28, that's 13 below aver. Sunday sunny, high 60, that's 6 below aver, low 43 which is 2 above aver. Which weather service do you rely on for the most consistently accurate forecast? I rely on NOAA. We've cracked -10 in Troy. Wind chill is -33 and the temperature is supposed to fall even further. 45 miles north of me in Queensbury, it's -12 and forecast to hit -20 actual temperature. Skies are pretty clear. I haven't stepped outside in 7 hours, nor do I plan to until the temperature nears zero. Yep. -10 here, too. 17 mph wind. Unlike cl94, I ventured out. I was up in Glens Falls earlier. It was brutal walking along Glen Street. Even 7-8 hours ago, it was -6 with -20 wind chill. -6 here. Given last year, it's only a ripple. Currently 8 here. Currently expecting another 6-12" of snow on Monday. 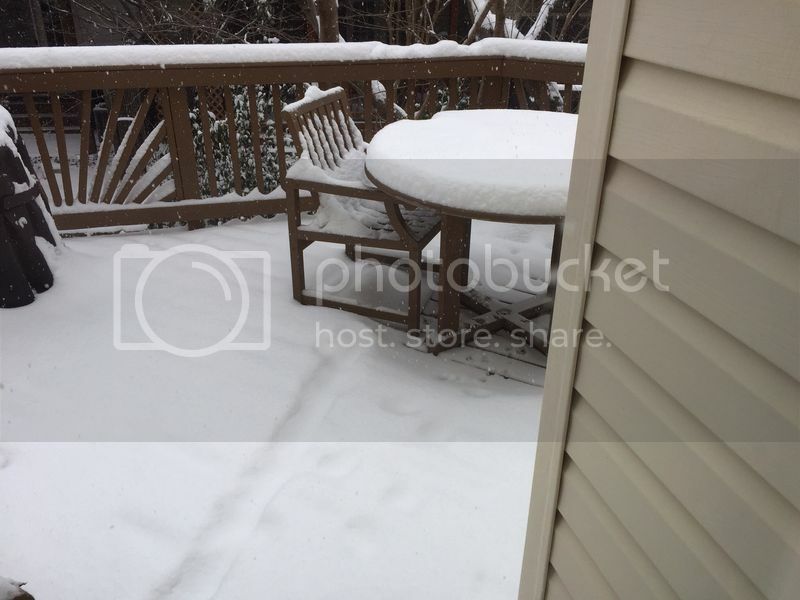 Our deck at 10:00 this morning. That sort of path in the foreground was created by a squirrel who was out there when I came downstairs at 7:30. The path is no longer visible as I type this at about 10:35. Not a lot of snow, but it's supposed to turn to sleet and freezing rain this afternoon. No plows yet either, naturally. The snow is deeper around the front of the house and in the driveway due to the direction in which the wind blows. Right now, 21 degrees Fahrenheit here, feels like 13 degrees, and snow is in 47 minutes, later becomes ice. Minor amount, 2-4 inches. Probably why it's so cloudy. Sunny for the second day in a row - which is the first time in ages (early December?). Yesterday had much stronger wind, which was bitingly cold, but today is still cold (reached a high of 40 today - which is a cold high for this part of the world), but doesn't feel bad with just a thick jumper. Still that annoying deception of warmth, due to not being dreary and wet looking, but rather bright and sunny (really bad in the mornings as sunny mornings are cold mornings in winter, but warm the rest of the year), but at least you don't need a windproof coat and some other layers. Murky day here with afternoon temperatures in the low 70s. Heavy overcast, drizzle with periods of showers, expected to continue for at least a week. Going to be 53°F today and rainy (see posts above ). Same here on the other side of the US, starting this afternoon, which would be good for melting snow. I'm currently trying to dig the cul-de-sac out of the snowpile the plows left so that the rain would find an easier way to get there. The Boston area saw ice over 1/2 to 2 inches of snow overnight, now 45 degrees out and melting. Heavy rain, thunderstorms, and gale force winds forecast for late afternoon and evening. Proving the old addage "If you don't like the weather in New England, just wait a minute." The Philly area is even more dramatic. About 2" of snow on Sunday, and currently it's in the upper 50's. It's nuts here. It's a full 60 degrees warmer than it was less than 3 days ago. Pouring rain. 52 and overcast here in Huntsville, AL currently. Can't this heat go away? 94 degrees!!! A storm front passes by on Thu. with temps 20 degrees cooler in the 70s and some cloudiness. 63-degree swing here in 2-1/2 days. First day without full long underwear in weeks.